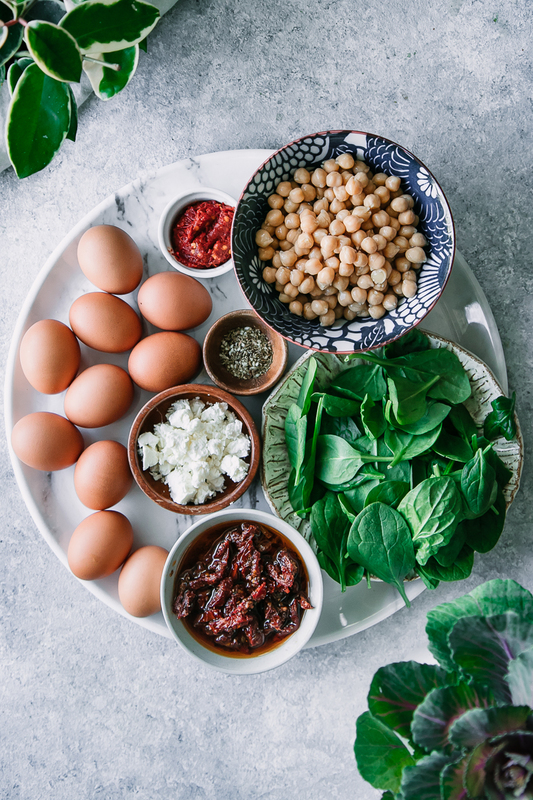 Mediterranean Chickpea Harissa Frittata, a simple one-pan vegetable frittata made with pulses, sun-dried tomatoes, spinach, feta cheese, za’atar seasoning, and spicy harissa. A simple savory breakfast or easy cast iron skillet weeknight meal! Question for you: do you consider frittatas a breakfast or a savory lunch or dinner meal? I tend to prefer savory breakfasts in general, but frittatas are firmly a dinner in our house. Breakfasts are typically simply eggs and toast, but frittatas — with their vegetables and cheese and savory spices — are savored at dinner with a big salad on the side. What makes frittatas such a fan favorite is that they truly are one of the most versatile and easy dishes out there for eaters who are looking to go green. Have vegetables that are on their last leg and must be used before they go bad? Throw them in a frittata. Need a simple one-pot (or pan) dinner that’s ready in under 30 minutes? Frittatas to the rescue. 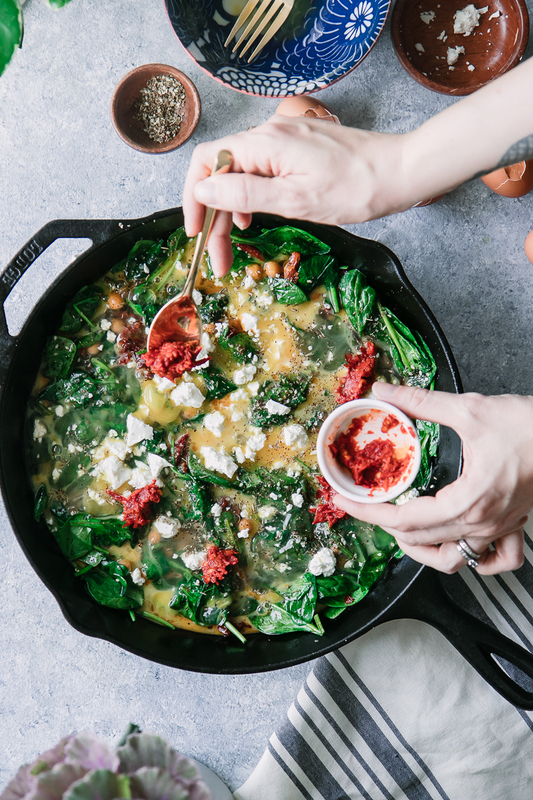 This Mediterranean-style frittata is one of our favorites: chickpeas, sun-dried tomatoes, and spinach as the base and topped with feta and spicy harissa sauce. Add a sprinkle of za’atar seasoning (a mixture of oregano, thyme, marjoram, sesame, and sumac) and you have yourself a simple 30-minute meal that’s packed with Mediterranean flavor. First, preheat your oven to 350 degrees F so it’s warm and ready for the frittata. Meanwhile, heat a cast iron skillet over medium heat and add olive oil and chickpeas, cooking low and slow to allow chickpeas to release their liquid and begin to dry out a bit. This step is important because chickpeas are packed in liquid (called aquafaba) and if you don’t dry them out they will release more liquid as they cook and your frittata will be mushy. When the chickpeas are dry and beginning to brown, add sun-dried tomatoes and a little of their oil. Then add the spinach and za’atar seasoning and cook until the spinach is lightly wilted. Spread out the vegetables in the skillet and pour the whisked eggs over to evenly spread over the top. Next, spread out the vegetable mixture on the bottom of the pan and add the whisked eggs to the skillet, rotating it slightly to make sure the eggs coat the vegetables evenly. Cook a few minutes on the stovetop until the bottom of the eggs begin to set, but don’t move the eggs around with the spatula because we want a frittata here…not scrambled eggs. When the eggs are about halfway cooked, add the feta cheese and spoon the harissa over the top of the frittata and sprinkle with salt, pepper, and more za’atar. Then remove the cast iron skillet from the stovetop and place in the oven. Bake until the top of the frittata is cooked, about five minutes total. Finally, remove the skillet from the oven and let cool slightly. You can serve straight from the skillet or ease the frittata from the pan to a serving plate and cut to serve. Sprinkle feta cheese and spoon harissa sauce over the top of the frittata before cooking. 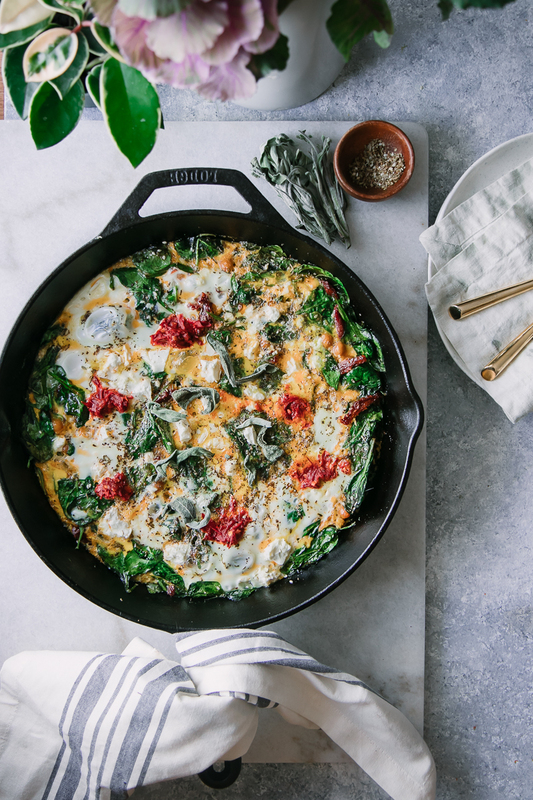 This one-pan frittata recipe is simple to make, but there are a few tips and tricks for streamlining preparation and making the most of of your ingredients. Invest in a cast iron skillet: a cast iron skillet is essential in a green kitchen because it’s one tool that can be used in many ways, from stovetop to oven and even on top of a grill. Save your chickpea liquid: you know the liquid that comes in the can of chickpeas? It’s called aquafaba by foodies and can be used in place of eggs in vegan baking. Save that liquid to make the most out of your canned pulses. Save the oil in sun-dried tomatoes: don’t throw out the oil that comes in a jar of sun-dried tomatoes! Save the flavorful oil and use in salad dressings, on top of oil-based pizzas, and for a tasty drizzle on top of eggs or even this frittata. Love this simple frittata recipe? Check out our other seasonal breakfast recipes, like this Maple Cinnamon Pumpkin Seed Granola or Gooseberry Currant Yogurt Bowl. Did you make this Mediterranean Chickpea Harissa Frittata? Leave a comment below and rate the recipe to let us know how it turned out. 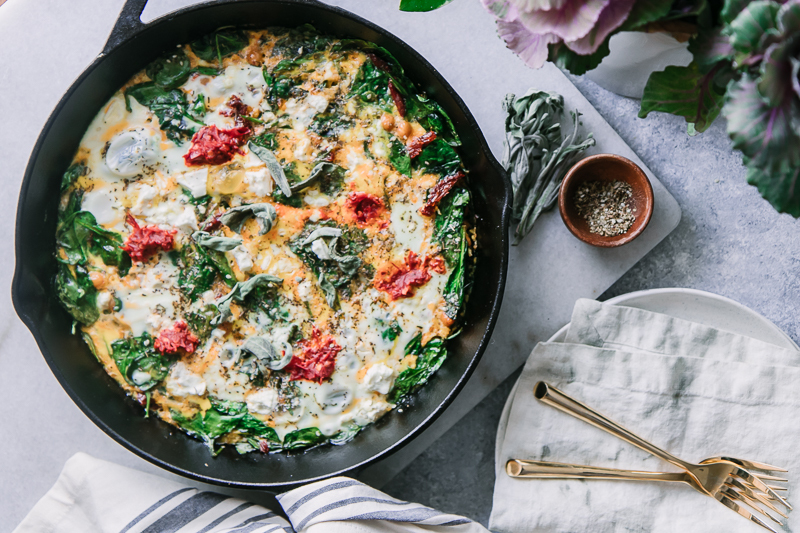 Save this breakfast recipe for later by pinning to your favorite winter Pinterest board and make sure to tag me on Fork in the Road’s Instagram to show me your frittata creations! Heat cast iron skillet over medium heat. Add olive oil and chickpeas, cooking low and slow until chickpeas release liquid and begin to dry out and brown. Then add sun-dried tomatoes with a bit of their reserved oil, spinach, and za’atar seasoning and cook until spinach is wilted, 2-3 minutes. 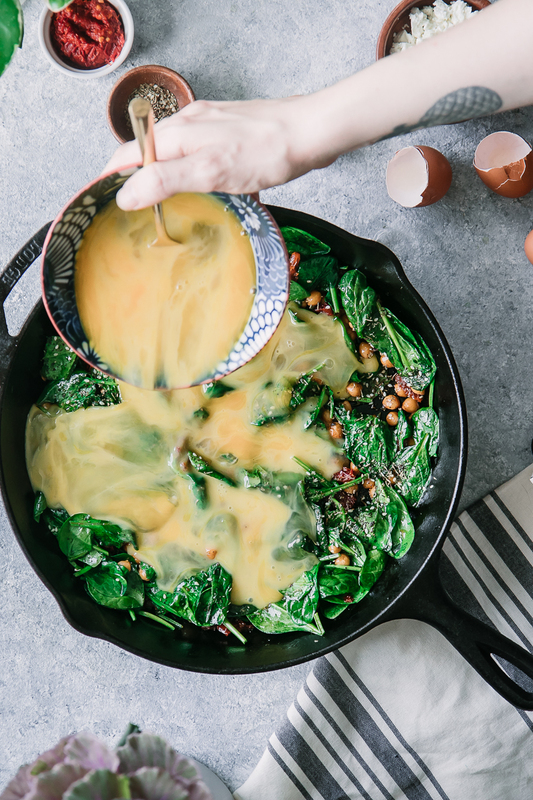 When spinach has wilted, spread the vegetable mixture out evenly in cast iron skillet and then add the whisked eggs, rotating pan to ensure eggs evenly coat the vegetables. Cook over medium heat until the eggs begin to cook about halfway through. Do not move eggs and vegetables around with spatula on pan, let the eggs cook without moving so the frittata sets. When eggs are about halfway cooked through, add the feta cheese and spoon the harissa sauce over the top of the frittata and sprinkle with salt and pepper. Remove cast iron skillet from the stovetop and place on the center rack in the oven. Bake until the top of the frittata is cooked, about five minutes. Remove from oven, and let cool slightly. To serve, cut into pie slices or squares and remove from pan with a spatula. 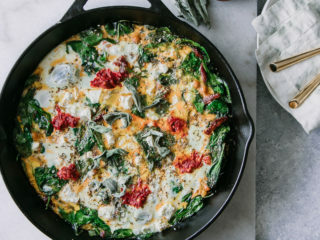 Nutrition notes: this vegetable and cheese frittata is high in protein, iron, vitamin A, and vitamin C and is low in carbohydrates and total calories per serving. Pair it with a side salad with a simple olive-oil based dressing for a complete meal.